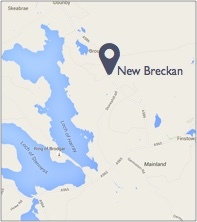 New Breckan is the perfect Orkney self catering cottage accommodation for a couple, at a competitive weekly rate. Ideally located in the country, in the heart of the beautiful West Mainland. This making an ideal base for visiting the many world famous archaeological sites such as Skara Brae, the Ring of Brodgar, Maeshowe, all of which are just a few miles away. There are free fishing lochs, and RSPB bird reserves nearby for those who are interested in viewing the rich wildlife Orkney has to offer. The Cottage is owned by Sandra Davies, a local lass born and brought up in the area. She is at hand for any advice or assistance you may require. She has the cottage comfortably furnished, with a newly refurbished kitchen new to 2015. There is also a wet room, which gives easy access for those with limited mobility. There is ample safe parking for a car with the use of a garage to store any fishing gear, bicycles, canoes etc, and a private garden to relax and take in the tranquil surroundings. Within a 3 mile radius you can find hotels with restaurants, pottery and craft shops, grocery stores, a local butcher, hairdressers, a church and local community centre – all of which will help make your holiday a truly wonderful time in Orkney! Great base for sightseeing – very central.